The Mexican peso is rallying on Monday after the US, Canada, and Mexico announced a new trilateral trade agreement called the USMCA, abandoning the North American Free Trade Agreement (NAFTA) term. The peso’s strong performance to kick off the trading week comes after recording an admirable third-quarter performance among emerging-market currencies. Hours before the key US-imposed October 1 deadline, the three nations announced a new trade pact that will likely go into effect in the second half of 2019. The Prime Minister and President stressed that the agreement would bring the countries closer together, create jobs and grow the middle class, enhance North American competitiveness, and provide stability, predictability, and prosperity to the region. The leaders agreed to keep in close touch and move the agreement forward. The conclusion came at the right time because the US midterm elections are a little more than a month away and Mexico’s president-elect will soon take office. Also, Canada will be holding a general election in the spring. So, what is inside the agreement? US farmers will have better access to Canada’s supply-managed dairy market. Online cross-border shipments to Canada worth less than $150 will not be subjected to duties anymore. Canada will be exempted from auto tariffs, but the exchange of aluminum and steel tariffs remain in place. The new trade deal will also allow independent panels to resolve trade spats. The USCMA is good for 16 years, but it will require a so-called joint review every six years. This comes as the Mexican peso is fresh off a record third quarter after topping the list of emerging market currencies. The peso surged 6.5% in the July-to-September period, something that stumped analysts who were not expecting such a performance in 2018. The peso benefited from reaching a bilateral trade deal with the US in August. 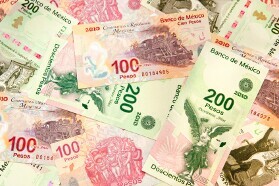 The USD/MXN currency pair tumbled 0.19% to 18.6915, from an opening of 18.7235, at 17:09 GMT on Monday. The USD/CAD fell 0.85% to 1.2801, from an opening of 1.2911. If you have any questions, comments, or opinions regarding the Mexican Peso, feel free to post them using the commentary form below.